- a panoramic terrace furnished with deck chairs, table and chairs. Air conditioning (cold / heat) in all rooms and unlimited Wi-Fi connection throughout the villa. The garden, the swimming pool with sun beds, changing rooms, baths and showers, children's play area, laundry with washing machine and iron, panoramic terrace with views of Mount Etna are shared and for the exclusive use of apartment guests. Parking space in the parking lot of the villa. Imagine to swim in a big pool while looking at the whole Ionic coast, then just turn back and see the Etna: you're in our Villa Rose! The villa is made up of 4 Suite-Apartments, each one independent of the same time. This Villa relies on the territorial tourist service of "SunTripSicily". "SunTripSicily" is our territorial tourist service: local assistance for our guests is constantly and discreetly guaranteed 24/24 h from the moment of booking until departure. The services are handled with care and professionalism by our team that regularly visits our properties, knows our destinations very well and will be expertly placed to answer any of your questions. Suntripsicily's work is focused on meeting our guests' wishes and making their stay as much comfortable as possible! The structure has a unique location, this makes it a prestigious and high potential. This area offers a lot, with the Suites Elena&Lorena I work at best. This area is among the most beautiful of Sicily, both naturalistic and cultural level: I offer a foothold and precious for the aid he wants to explore in every aspect. Our Suite apartments are immersed in the Sicilian countryside. The apartments are located on the slopes of Mount Etna, its location offers a unique view of the Central crater and a splendid panorama on the coast, from Catania to Taormina. The nearest beach of Fondachello di Mascali ' in any case is only 10 min (2.5 km). The location provides tranquility, relaxation, privacy and stunning views. The area is of cultural, historical, naturalistic interest and wine. In summer time (from the last week of May to the first week of September) our guests have “ENTRY+SUNBEDS + assigned UMBRELLA" in the private small pebble beach (small small rocks like sands) called "LIDO LUNA ROSSA" for all the duration of their stay. The lido is provided with bar, restaurant serving typical gastronomy for lunch and serving meal at any times, pizzeria, cocktail bar, solarium, beach volley court, beach life guards, entertainment and much more especially in summer time. Modern and spacious bathroom. Shower and shower of glass and steel. Shower head with large water flow. Luminous mirror and cabinet of the suspended bathroom with drawers. Independent air conditioning system for every room in the house. Cold & hot air. Independent air conditioning system for every room in the hotel. Cold & hot air. Washing machine in common laundry room downstairs. Provide Soap and whatever you need to wash.
WiFi internet connection at high speed. All indoor and outdoor areas (including swimming pool) are covered by wifi network. The living room is spacious. Here you will find an openable sofa three-seater that can act as a 4th bed. You will also find a flat-screen Tv and a satellite. On request, you can find spices typical of our land or else in the kitchen. Dishes and cutlery 'Tognana - Made in Italy' quality. Glasses for wine, coffee cups and everything you need provided for 6 guests. Modern and functional kitchen with all the cutlery, utensils and accessories. Indoor dining room in the kitchen with tables and chairs for 6 guests and in the terrace also tables and chairs for 6 guests. HD flat screen Tv. You can request a dvd players or whatever before your arrive. Large garden outside with olive and palm trees and a children's playground. Balcony across the Ionian coast-Etnea. From Taormina to Catania landscape is breathtaking. The Pool is reserved only for the guests of the Suites inside the Agriturismo Rosemarine. This in NOT a public Pool. It is possible to reserve the three apartments in full for groups or large families (6+). The houses are NOT connected internally but from the outside. The large panoramic terrace and the areas adjacent to the pool will allow you to spend beautiful days together. Depending on the season, we apply special rates for the rent of suite-apartment in full. 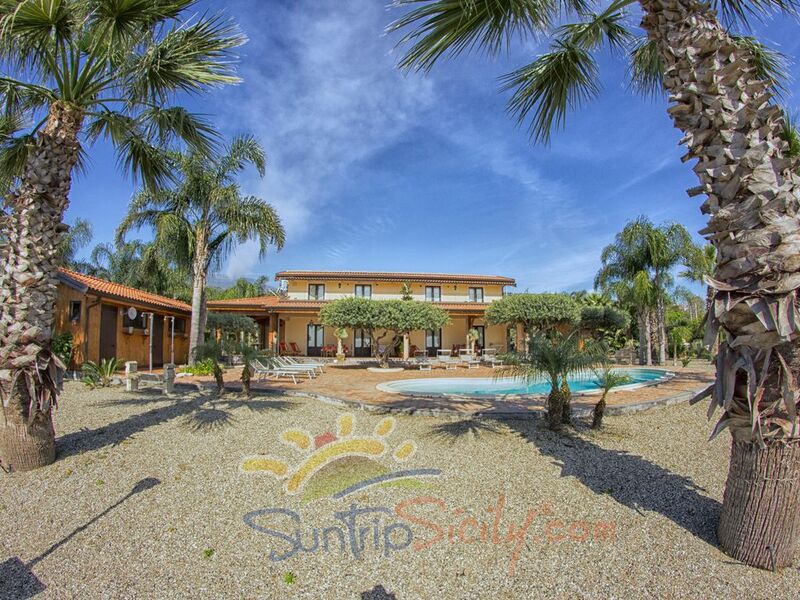 Villa Rosemarine Belong to the Vacation Rentals Network "SunTripSicily". Find us online, visit our web site and contact us for more information. Nous avons passé une excellente semaine : l’appartement est très bien agencé et équipè, très propre et l’environnement est calme. Jolie piscine avec très belle vue mer. On peut profiter du service de la plage qui est à 15 minutes en voiture. On est aussi proches de Taormina (que l’on voit au loin). Chiara et Giovanni sont adorables et particulièrement disponibles. Grazie mille, è stato un piacere essere vostri ospiti! Corinne grazie mille <3 ospitare te e la tua meravigliosa famiglia è stato per noi un vero piacere! Ci auguriamo di avervi nuovamente nostri opsiti in futuro. Tenetevi aggiornati attraverso il nostro network SunTripSicily con tutte le nostre novità. Wohnung und Anlage sind sehr schön. Von Giovanni und Carla wurden wir super betreut. Ein Wagen ist zwingend nötig, die Lage ist sehr abgeschieden. Der Service mit dem zugehörigen Lido am Strand ist sehr angenehm. thank you very much for your message, it has been a pleasure having you and your lovely family as our guests! Hope to see you soon again! A presto! Bel appartement récent, très bien aménagé avec climatisation avec piscine commune aux différents locataires. Dommage car l'endroit semblait agréable et les voisins sympathiques mais les courtes nuits ont gâché le séjour. Die Wohnung ist gut und zweckmässig eingerichtet. Es hat, bis auf einen Kaffeefilter bzw einen etwas größere Espressobehälter, an nichts gefehlt. Der Balkon ist groß mit schöner Aussicht bis zum Meer. Allerdings sehr heiß, da die Sonne von früh morgens bis spät nachmittags draufscheint. Es fehlte ein guter Sonnenschirm. Man konnte aber gut auf den Bereich des Swimmingpools ausweichen, der sehr schön ist, mit genügend Liege- und Schattenplätzen. Wir konnten uns überall frei bewegen und das Haus ist ein guter Erholungsort mit einigen Sehenswürdigkeiten in der Nähe. Der Verwalter ist sehr hilfsbereit und versucht alle Wünsche zu erfüllen. Den Besitzer , der mit im Haus wohnt, bekommt man fast nicht zu sehen. Die Eingangstür zum Grundstück könnte einen Tropfen Öl gebrauchen, sie quietscht sehr laut. Wir sind trotz ein paar Kleinigkeiten sehr zufrieden und haben uns gut erholt. Vielen Dank für die Freundlichkeit. superbe location dans un endroit de rêve ! Très bon accueil de Giovanni qui a été de bon conseil pendant notre séjour. Location propre, spacieuse, meublée avec gout et très bien équipée, piscine et vue sur mer au pied de l'Etna. rien de manquait , nous avons passé 2 semaines magnifiques !!! La propriété est très propre et confortable. Elle dispose d'un grand jardin et d'une très agréable piscine bien pratique pour se rafraîchir (avec vue sur la mer). Giovanni nous y a réservé un sympathique accueil et était très disponible pour toute question. Des transats sont également réservés à la plage du Lido Luna Rossa pour les locataires intéressés. Nous avons passé une très belle semaine dans cette maison que nous avons quittée à regrets; un excellent souvenir. The location of the villa offers a stunning view over the Eastern coast of Sicily from Syracuse to Taormina. The hotel is perfect for any kind of trip around the best places worth visiting in our island. In the summer time (from the last week of September) for the duration of their stays, our guests have "ENTRY + SUNBEDS + assigned UMBRELLA" in the private small pebble beach (small small rocks like sands) called "LIDO LUNA ROSSA". Bar, solarium, beach volleyball court, beach life guards, entertainment and much more especially in summer time. NOTE: - Refundable Security Deposit € 100,00 by cash during the check-in process. - Electricity & A/C: 80Kwh/week included. When electricity is consumed responsibly, for example lights and/or AC are turned off when leaving the house, the kWh included in the rental price are typically enough to cover guests' electricity needs. (Extra 0,30€ per Kw/h). - Bed linen and towels Kit both for bathroom and for swimming pool/sea included. - On request cleaning service and change of bed linen during the stay € 80,00. - For stays of more than 7 days, the mid-stay cleaning service is require.